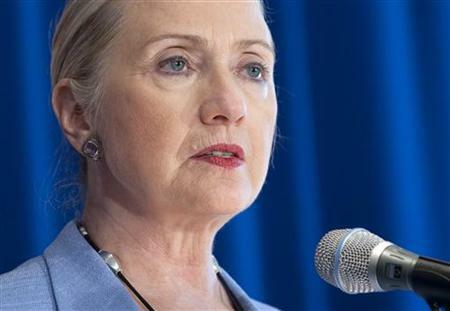 U.S. Secretary of State Hillary Rodham Clinton said Monday the U.S. has “`serious concerns” about the conduct of Russia’s parliamentary elections. Young people exercising their constitutional rights to protest against the disgusting, vile, anti-capitalist and unconstitutional bailouts of Wall Street financials are being pepper sprayed, beaten down to the ground and stamped on. The American Senate passed the NDAA — an act that authorises the military to arrest and indefinitely detain any citizen without trial, and that defines the entire United States as a battlefield. Banks and Washington insiders get pumped flush with cash while wider society remains in the throes of a devastating contractionary depression and crippling unemployment. The Guantanamo Bay detention camp remains open, almost three years after Obama pledged it would be closed. No Bush administration figure has been prosecuted for violating the Constitution and the Geneva Convention by authorising torture. Obama continues to renew the illiberal, reactionary, unconstitutional and widely-abused Patriot Act, a piece of legislation that mandates mass surveillance of Americans in violation of the 4th and 5th Amendments. While it is impossible to hold up Russia under Putin as a paradigm of human rights and democracy, America today can hardly consider itself any better. Of course, this isn’t really about democracy. Vladimir Putin has accused the US of encouraging the protests over Russia‘s parliamentary election and warned of a wider crackdown on unrest. The Russian prime minister said Hillary Clinton, the US secretary of state, “gave a signal” to Kremlin opponents by describing the country’s parliamentary election as rigged. “They heard this signal and with the support of the US state department began their active work,” he said. Russia is a mineral- and resource-rich nation with the largest landmass in the world. Quite a prize. 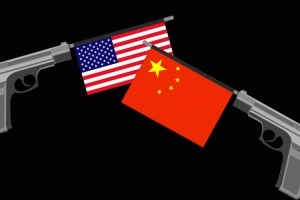 I believe that the current world order suits China very much — their manufacturing exporters (and resource importers) get the stability of the mega-importing Americans spending mega-dollars on a military budget that maintains global stability. Global instability would mean everyone would pay more for imports, due to heightened insurance costs and other overheads. China also recognises that while America falters and struggles under the weight of its military burden, its lack of growth, and its deep debt concerns, Chinese military strength can grow at a much faster pace thanks to Chinese domestic growth, and a high domestic savings rate. They are happy that their dollar pile — China has over $3 trillion in foreign exchange reserves — can still buy plenty, and they want its value to remain as stable as possible. But above all they want to gradually diversify out of those dollars and into productive assets. So, if China is happy with the status quo, or at least where the status quo is going, what does America want out of all this? America wants to keep the free lunch of oil and goods for dollars and treasuries that is so swiftly evaporating. Someday soon America will have to bring more to global trade than its role as global policeman, its universities and a humungous stack of freshly-printed dollars. While some may carp about the demand created by the American consumer, consumption is not production — consumption does not bring anything to the party except dollars, and the rest of the world already has plenty of those. Some day soon, when the dollar is no longer recognised as the universal reserve currency, America will have to face up to the fact that consumer goods and oil will cost more and more in dollars — and she will either have to choose to be poorer, or to manufacture more, and generate more energy at home. A sensible American plan going forward would recognise this, and would be developing the means and the infrastructure to end America’s free lunch — specifically, through redeveloping American manufacturing capacity and supply chains, and scaling back America’s role as global policeman. Unfortunately, I see no such thing from government, and very little from private industry. America is clinging onto the old foreign policy doctrines — that if America is powerful enough, and if she can retain its role as global hegemon and world policeman, then she will always be free to consume a chunk of the rest of the world’s production and resources, because her currency will forever be the global reserve. But that simply isn’t true — Russia and China have already ditched the dollar for bilateral trade. Sadly, America’s foreign policy is ever-more fixated on interventionism, and maintaining the petrodollar standard. Essentially, American exceptionalism has created a blindness to reality. Humungous debts to hostile creditors often makes an empire fall. Resource and energy dependency often makes an empire fall. Yet America just continues spending ever greater amounts on her military, and just hopes for the best. Every President since Carter has promised to reduce American oil dependency, but there has been no substance to that. So — absent any real progress on reducing dependency — America’s endgame seems to involve taking the Arab Spring to Tehran, Islamabad, Moscow and Beijing, and having the new middle classes of consumerist Americanised zombies take out uppity creditor regimes — and replace them with Facebook-friendly State Department-endorsed place men, and adhering more closely to edicts out of Washington. That way, America’s free lunch can go on forever. Washington is stepping up attempts to isolate Tehran after accusing factions in the Iranian government of a plot to assassinate the Saudi ambassador to Washington on US soil. The US announced new economic sanctions against five Iranians, including four senior members of the Quds force, the special operations unit of the Iranian Revolutionary Guards, which American officials have implicated in the alleged plot. 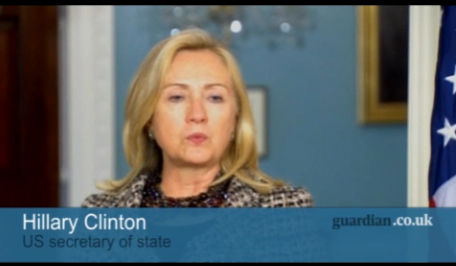 Sanctions were already in place but the US secretary of state, Hillary Clinton, said a “very strong message” needed to be sent to the Iranian regime. She said she and Barack Obama want to “enlist more countries in working together against what is becoming a clearer and clearer threat” from Iran. What was that someone said about war being the easiest way to wipe the debt clean? Instilling a sense of purpose in divided, angry and confused populations? Creating humungous profits for the military-industrial complex? As I have continuously noted since the very beginning, America has a hell of a lot to lose through drift (not least the dollar-denominated status of energy and resources) — power is drifting Eastwards, and an increasingly indebted, self-doubting, nihilistic and stagnant population is shifting America from its cherished status as world policeman to that of a second-rate economic power. Simply, all the capital that America has exported in exchange for the Nixonian energy and consumption free lunches will come back to buy up American productive assets. No amount of nuclear weapons, and no amount of currency manipulation allegations can save America from this fate. So Washington’s present rationale might well be that with Eurasia strengthening and uniting behind an increasingly untrustworthy, authoritarian and anti-American set of leaders (Ahmadinejad Putin, Wen), now might be the last chance America has to preserve American imperial hegemony (and the dollar as the global reserve currency). Throw the dice, sell some weapons, shake the barley, see where the chips land. After all, if the people of Eurasia want (American style) democracy and capitalism, a regional war would be the best chance that they have of taking the Arab spring up an echelon, and onto the streets of Tehran, Beijing, and Moscow. The problem with that great-American-hope is that it’s not the people of Eurasia who seem to have a problem with their government, but the people of America. For better or worse, Eurasian autocratic dirigisme seems to be yielding better economic results on the global stage than American-style liberal democracy. After the dust settles and the debt is purged we can again walk the road to sustainable economic development. The problem, and the great worry, is getting there. This summer, despite America’s continuing financial crisis, the Pentagon is effectively considering trading two military quagmires for the possibility of a third. Reducing its commitments in Iraq and Afghanistan as it refocuses on Asia, Washington is not so much withdrawing forces from the Persian Gulf as it is redeploying them for a prospective war with its largest creditor, China.